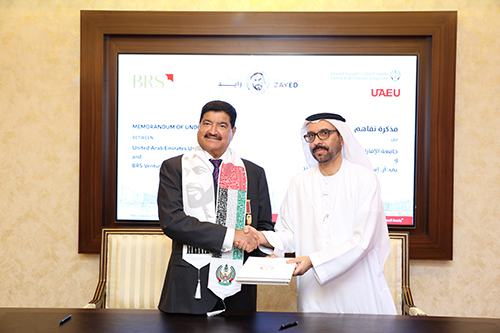 Abu Dhabi, November 27, 2018: BRS Ventures and United Arab Emirates University (UAEU) yesterday signed a Memorandum of Understanding (MoU) to provide graduate placement opportunities. Deserving students graduating from UAEU will be given preferential placement at various entities held by BRS Ventures. Career advice, participation in careers fairs, practical exposure of working in the corporate world will be made available. Competent students will also get to spend 8 to 16 weeks as internship, at BRS Ventures companies. The collaboration with a UAE based education entity is a first for BRS Ventures. The MoU is a part of BRS Ventures’ Year of Zayed celebrations. BRS Ventures is a leading business house headquartered in Abu Dhabi, UAE. The company manages multiples businesses across Healthcare, Education, Financial Services, Pharmaceuticals, Hospitality, Environment and other sectors in UAE, India, Africa and other parts of the world. UAEU is the first and foremost comprehensive national university in the United Arab Emirates. Founded in 1976 by the late Sheikh Zayed Bin Sultan Al Nahyan, UAEU currently has more than 15,000 Emirati and international students. As the UAE’s flagship university, UAEU offers a full range of accredited, high-quality graduate and undergraduate programs through nine colleges.